(Phys.org) —What would Intel do with a company focused on motion sensing technology? A number of ideas circle around the announcement this week that Intel has bought Israel-based Omek Interactive. An Intel spokesperson in Israel said the deal would raise Intel's capabilities in immersive "perceptual computing" experiences. Perceptual computing refers to a changing of the guard—the core functional tools of keyboard and mouse—in human and computer interactions. Intel would like to be in step as many technology innovators look for other ways to interface with computers. Perceptual computing deals with sensory technologies that involve human gestures and voice. Intel Capital, in fact, had provided Omek, headquartered in Bet Shemesh with an office in Taiwan, with financing in 2011. Now Omek is under its wing. Some outside watchers suggest there may be a time when any desktop, laptop, tablet, or smartphone that ships with an Intel processor will have gesture-sensing built in. Visitors at the CES 2013 show had the opportunity to learn more about Omek's software, involving gesture recognition and body tracking. Janine Kutliroff, CEO, and Eli Elhadad, vice president of game development, demonstrated Omek's technology. Instead of being bound by machine language, said Kutliroff, the company wanted to take away those boundaries with interactions using gesture commands, not screen touch. The products are designed for use in TVs, game consoles, computers, interactive signs and medical devices. Omek uses a sensor to determine a person's movements and then integrates that data into a target program. The Omek products work with 3-D cameras and support a range of processors and operating systems. Omek is a software company with the motto, "Control everything without touching anything." Its products include both close-range and long-range body tracking. The long range solution, Beckon, is a set of middleware and tools, using full body tracking to determine a user's movement. Grasp is a development suite that works at close range with PCs, working with smaller, more detailed movements. 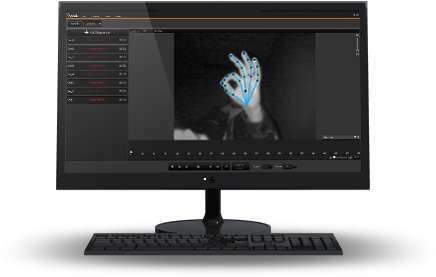 Grasp processes input from a type of depth camera, optimized for close-range operation. These close-range cameras are developed into modules. They can be incorporated directly inside the chassis of PCs and tablet devices. Grasp takes the depth map from these cameras and segments the user's hands from the rest of the scene. Grasp then constructs a skeleton made of 22 joints for each hand and tracks the position of the joints on a frame to frame basis. Outside of Intel, company watchers think that the deal may be linked to a set-top box that Intel plans to deliver. In April this year, stories circled around Intel's plans to deliver the box. A company spokesperson had said Intel's set-top box would have a camera with recognition technology, but that it would be used for identifying users and bringing up preset configurations on the box. The TV box could then maintain profiles of the programming each of them prefers. And, in keeping with our national policy, the set-top box can bring surveillance right into your living room. How very homey!